Londoners do like to climb stuff, as I mentioned here before, but in the winter there’s so little daylight that by the time you get to the top of whatever monument – the Shard, the London Eye, the O2 – it’s too dark to see anything. So at this time of year we have to resort to our second favourite activity, if we can’t climb it, we light it up! All around the city you’ll see bridges, tourist attractions and famous buildings covered in pretty coloured lights. For the best view of all, stand on Waterloo Bridge and on one side you’ll see Parliament and on the other St Paul’s and the city, all reflected in the river – it’s stunning. 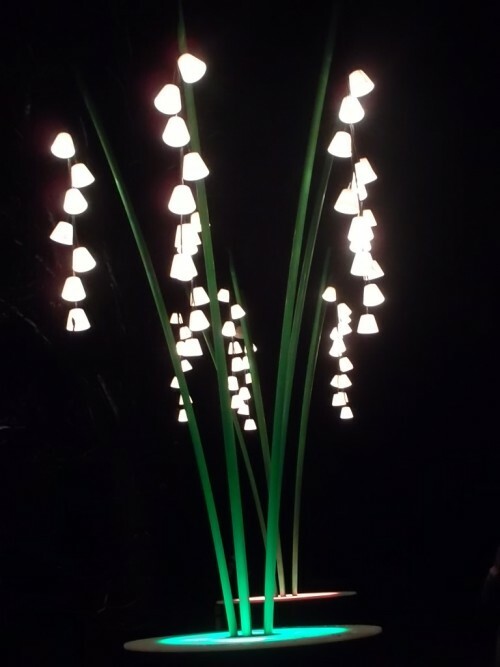 So given our love of lighting effects, it’s no surprise that this Christmas a number of London’s green spaces have created special installations to allow you to walk around after dark, drink mulled wine and generally feel very festive. 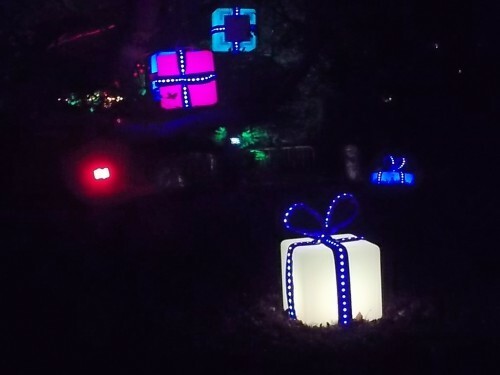 The most impressive of these is Christmas at Kew, a 75 minute walk around a darkened Kew Gardens (and thanks to fellow blogger The Four Kids One Mom Guide to London for recommending this). I know what you’re thinking, that doesn’t sound very safe; it’s a big park, few lights what if there are crazy people hiding in the bushes? Well there is an official trail to follow which only covers about a mile of the park space which is well staffed and doesn’t let you deviate into other areas, so there’s no chance you’ll be scrambling in the undergrowth till dawn. This is quite a well organised activity and even with timed entry from 5pm-10pm (last entry is 8.15pm) to control the numbers, it was quite busy on a Saturday night. It’s a big loop so you start off near the entrance with some stalls selling mulled wine and food should you need it before you make your way to the back of the Palm House which has various shapes, including snowflakes projected around while a looped piece of music controls the pattern of lights, and water sprays shoot on cue from the lake. Then, you’re guided through the Winter Garden where you’ll see some of the more interesting trees lit in a variety of colours and giant snowflakes projected onto the pathway. The most spectacular part is the giant light installations that look like a garden with flowers, trees and grass including one tree hung with Christmas presents. It’s like being in the flower garden from Alice in Wonderland, except they don’t talk to you – maybe next year! These amazing and beautiful light sculptures are incredible to wander through, from giant green grasses to enormous fruit trees and delicate flowers all made entirely of light. At this point you can divert to the White Peaks café for some hot doughnuts and mulled wine, while the children can make use of the mini Victorian Fairground with helter skelter and gorgeous old merry-go-round. It was -2c when we were there, so a midway break was very necessary to defrost your fingers. You get to walk through the flower garden again and on through a tunnel covered in small gold LEDs which looks amazing; it’s like walking through a Shirley Bassey dress. You pass a tree containing a few chandeliers before heading back towards the front of the Palm House for more coordinated lights and music from the Nutcracker, but this time there are shots of fire! 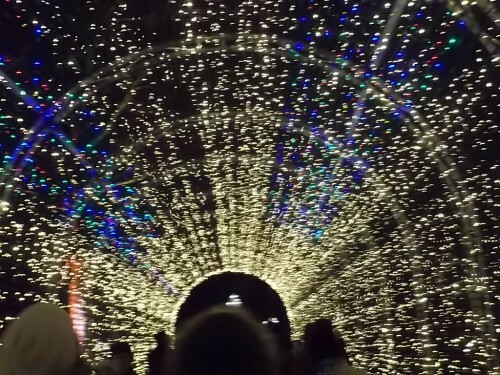 If you’re looking for an alternative Christmas or New Year activity then this light trail at Kew is a great family outing with fairground stuff for the children and some art and mulled wine for the adults. Seeing as we are in almost perpetual darkness at this time of year, then any time from 5pm when it opens and you’ll be able to see the sculptures and installations to best advantage. It’s fairly standard London prices as well £15 for adults and £10 for children aged 4-16, with family tickets available, but make sure you book in advance. There are plenty of tickets available until 3 January but they tend to sell out before the day you go. It may be a bit on the expensive side but it’s an unusual activity and one that gives a renewed purpose to an area of London that’s synonymous with spring and summer. Since it is Christmas, it’s nice to see something with a bit of wow-factor which this certainly has. Maybe next year someone will combine London’s two favourite activities and light something you can climb up! Christmas at Kew runs from 5pm-10pm (last entry 8.15pm) until 3rd January, tickets are £15 for adults and £10 for children. Londoners love to go up stuff. We like to be able to stand high above the city and look over its vastness, as far as the eye can see, and point at buildings we recognise. The viewing platform comes in many guises these days and it is something that has become peculiar to city life. No one seems to build these in the middle of the countryside where arguably there are lots of beautiful things to look at – this is presumably because any suggestion of building in green places tends to result in the locals brandishing pitchforks; if you want to see views in the country, you go up a hill. Nonetheless, city dwellers love standing hundreds of feet above ground and looking down at the cars, train stations and densely packed buildings in order to feel part of it all. You can go up the Shard, up St Paul’s, up the London eye, up the unpronounceable Orbit-thingy at the Olympic Park, and increasingly up to roof-top gardens and events across the city. Now, you can also go up the Millennium Dome. And yes, I know it’s called the O2 these days but another thing Londoners do is to call things by their original or ‘quirky’ name no matter how many times it’s rebranded (see also Olympic Park – no offence to HRH but who is going to remember the Queen Elizabeth bit?). The first person to go up the Millennium Dome was actually James Bond when he accidentally fell on it, and there are references on the website cautioning you against a repeat of this iconic moment. The excellent pre-title sequence of The World is Not Enough in 1999 sees Pierce Brosnan’s Bond chase some baddies down the Thames in a boat before he ends up falling off a hot air balloon and bouncing down the side of the dome. It’s a great film opener and also a great film if you pretend Denise Richards wasn’t in it – “I’m a nuclear physicist”, yeah course you are love. Anyway I digress. Your journey begins at base camp – yes I know but go with it – where you are shown a safety video and how to use your kit. This includes a lovely sleeveless jacket, a safety harness which wraps around your shoulders and legs, and a special pair of hiking style boots designed to maintain grip on the bouncy walkway. This is still quite a new activity so the shoes are in good condition, don’t worry it’s not like going bowling. Once you’re fully rigged up, the instructor / guide checks everything and you climb the steps to the base of the roof, where you stop for a quick promotional photo (available later in the shop). It’s like abseiling, so you’re attached by a pulley-like contraption on your safety harness to a line which runs to the top of the dome, 52 meters above ground, and one-by-one you begin your ascent. It’s step-free but the initial angle is quite steep, although as you climb higher the gradient is reduced until it flattens out completely at the Summit. The climb itself isn’t too bad, and certainly far less strenuous than the steps to the top of St Paul’s, taking around 20 minutes depending on the group’s ability. You may find the bouncy walk-way a little disconcerting at first but it doesn’t move as much as you might fear. Once at the top, you’re given 15-20 minutes to look around and take photos – cameras and phones are the only items allowed with you, anything else is left in the locker-room. From the top you can see close by to the naval college in Greenwich, across to Canary Wharf and down to the Thames Barrier, as well as getting the Bond-eye-view over the top of the Dome itself. Then you begin the descent down the other side of the Dome, which some may find a little steeper, but here’s where the shoes come into their own with their helpful grip to keep you slip-free until you reach the bottom. All the way along the instructor is beside you ready to help if needed or point out particular landmarks, but otherwise leaves you to get on with it, which is great and certainly increases your sense of achievement. Unlike most of London’s other viewing platforms, this one is completely outdoors from beginning to end which makes it a much more interesting experience. The whole process from checking-in to packing up your kit on the other side is smoothly managed and you never feel even remotely unsafe. It’s also really fun and certainly feels more of an accomplishment than getting the lifts in the Shard. So as one of the more unique experiences, I would definitely recommend climbing the Millennium Dome to survey our fair city from yet another angle. It may not make you James Bond but as Londoners (or visitors to London) it is our duty to go up as much stuff as we can – do it, you know you want to! Up at the O2 costs £26 on a weekday and £33 at weekends and all equipment is supplied. Restrictions on climbers do apply and is not suitable for anyone under 10 years old, shorter than 1.2 meters or weighing more than 21 stone. Twilight climbs are also available.